I have decided that the best light for landing and taxi lighting would have to be High Intensity Discharge (HID) lights. 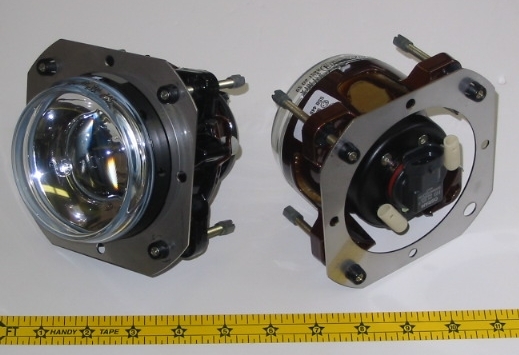 Unfortunately, the HID lights currently available on the market for aircraft lighting are grossly overpriced. My goal is to identify a reasonably priced HID unit that meets my specifications and help make them available to other aircraft builders. I have been working with some really great guys up in New Jersey who operate an internet shop that sells HID lighting and conversion kits called HIDFoglight.com. After several discussions about the unique requirements of experimental aircraft they were able to secure a couple of lamps to send to me for testing. Maximum lens diameter of 3.5"
These lights were shipped to me with 35 watt ballasts and H3 bulbs. They are also available with 50 watt ballasts (which we would want) but these are just for preliminary testing. I have powered the lights but am waiting for the special AMP power connectors that connect to the ballasts. The guys at HIDFogLight.com have set up a room on their HID Forum for Experimental Aircraft lighting. I will be hosting Q&A's there. 30 watt 3.5" HID Lamp with H3 bulb at 6000K. This lamp has a narrow beam pattern suitable for a landing light. 30 watt 2.75" HID Lamp with H3 bulb at 6000K. This lamp has a wide beam pattern suitable for a taxi light. As you can imagine, HID lighting is a new technology and their is a lot to learn. All I know is that these lights are super bright! They have no filament to break and have a burn life of about 5000 hours. These lights both come with a "U" bracket which attaches to the lamp body with bolts. The ballast attaches to the light body via a 16" insulated cord. It does not appear the cables are twisted or shielded in any way. The ballast is well constructed but does not incorporate any sort of mounting bracket for attaching it to the aircraft. This would have to be constructed. The connectors are water resistant AMP connectors. Ballast Ballast weight is 13.5 oz. The lamps are constructed of aluminum and appear well made. The lenses are glass and of significant thickness. 3.5" HID weighs 11.1 oz. 2.75" HID weighs 11.0 oz. I was able to detect EMI at a range of 5 feet using a handheld VHF transceiver. Obviously, this is a problem. Initially, I would suspect the H3 bulb, the ballast or the cabling. I'll report more on this later. 3.5" HID + Ballast weighs 1lb 9.2 oz. 2.75" HID + Ballast weighs 1lb 9.2 oz. We measured the temps for the 35W lights as well as 50W lights with a laser temp detector at a point 1" in front of the bulbs. After 5 minutes, the 35W bulb temp was	160°. The 50W bulb temp was 195°. 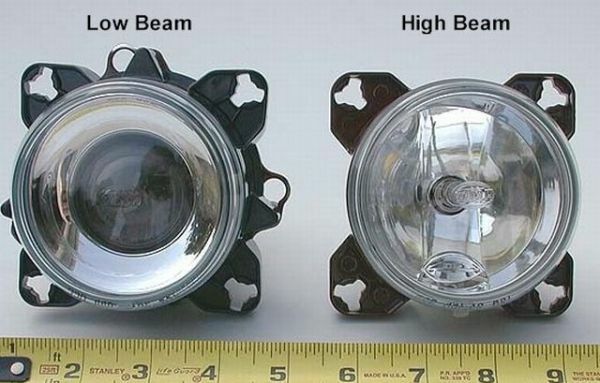 An interesting point about the H3 bulbs and 35W ballasts, like nearly ALL other HID systems developed for use in autos, is that they do not incorporate any shielding against EMI/RMI. The result is they are basically incompatible for use in aircraft. The H1 bulbs are different in that they have the igniter built in to the base of the bulb...Unfortunately, they too do not incorporate any EMI shielding. The guys at HIDFogLight.com are shipping me a new 50W ballast and bulb for testing next week. These ballasts are made in Germany and have far better shielding than what I have tested so far. 6/11/07: Today I received the 50W ballast and bulb from Aram at HIDFoglight.com. On initial inspection it appears well made with a cast aluminum housing and flanges for attachment. The cabling is approximately 12" in length but is neither shielded or twisted pair. This is the 50W H3 bulb. It is 6000K which is nearly pure white. The molded bulb holder is larger in diameter than the 35W H3 bulb and is not compatible with the holder clip of the 3.5" lamp. I powered the bulb and determined the bulb needed about 10 seconds to fully illuminate. The EMI discharge is MUCH improved over the 35W ballast and emits at a range of 8' (as opposed to a range of 12' for the 35W ballast). These things are really bright! We're on to something now! More testing details soon. I ordered a sheet of RMI/EMI polyester shielding film from Allied Electronics and received it a few days later. It resembles mylar but is actually a pretty sophisticated sheet that is embedded with aluminum. This film is rated to shield most effectively in the 100-300 MHz range. I conducted initial testing by just loosely wrapping the ballast in the shielding film and found the RMI/EMI range to be reduced to around 4-5 feet. I then cut a piece of shielding about 12" square and wrapped the ballast tightly. Now the RMI/EMI range was down to 2-3 feet. Next, I tried wrapping the ballast as well as the cabling up to the bulb but found no improvement in the shield effectiveness. The 50W ballast and bulb combination is clearly a vast improvement in lighting over any other available technology. The 6000K light color is a pure white color and works well for crispness and clarity. The temperature output, even at 195º, is reasonable and manageable for short-term operations. The RMI/EMI bleed can be managed down to a range of 2-3 feet using the inexpensive shielding (approx. $10 for a 36" x 42" sheet). While this would still have negative effects for using the lights within 2-3 feet of any antenna, the antenna would theoretically only be ineffective when the lights are turned on (as in taxiing, T/O and landing operations. I will be discussing my findings with the technicians at HIDFoglight.com and report back soon so stay tuned! Here is the new design we are considering for the lamps. They offer a bulkhead install with infinite micro adjustment. Update 12/24/07 I got the prototype lamps and tested them for light output. I must say they are really nice and appear to be made out of some sort of magnesium alloy. Unfortunately, they will not fit in the -9 wingtips. The max diameter the wingtips will allow is 3.50". While these lamps are 3.5", they have four adjustment flanges that make the lamps a total of 5.5" overall. These lamps will work great for those builders seeking to upgrade their leading edge light systems. Contact me if you are interested. We are still working to find a smaller lamp that will fit the wingtip yet perform with sufficient light output.